Channeled by Amaliah Grace 2004. Copyright. The first image above is the image used on which to meditate. The second image shows the relationship of the template upon the human body. The Human Alignment where the template lies within the physical form. Available to buy at the STORE. Amaliah Grace has been gifted as guardian of this template to assist humanity with their ascension process. 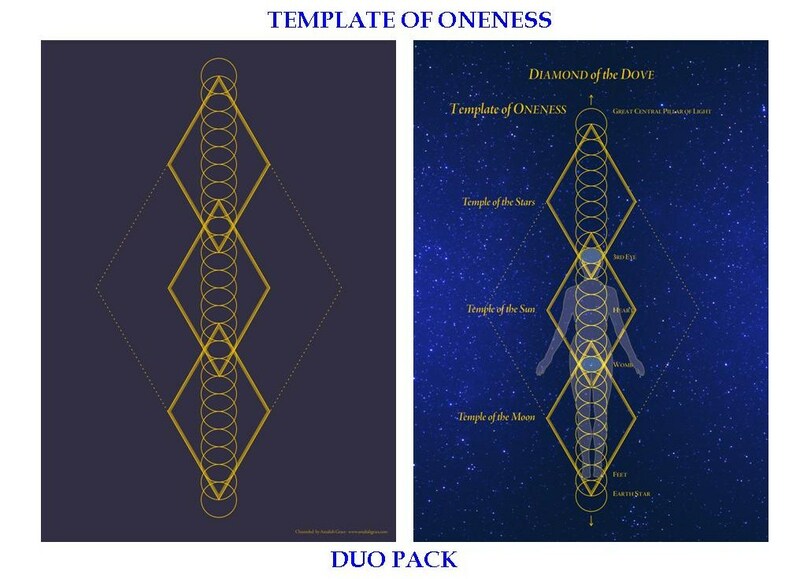 The Diamond of the Dove, the Template of ONENESS is a vehicle towards coming into your light body and connecting to the new Christ Consciousness beyond 2012. To be ready to receive the Template of ONENESS, you need to have surrendered your Ego Will and be in alignment with Divine Will. This is the key to initializing the template within your being and burning away the old Template of Duality. Upon surrendering to the Template of ONENESS the template of Duality is dissolved and the new template is activated and initialize. A high frequency of Golden Light pours in to upgrade your physical form. You receive a consciousness shift in your understanding of the role duality has played within your life and you are more able to function from a 5th Dimensional reality. You will resonate your actions and decisions from your heart-flames and allow the Divine to lead you. The Template of Oneness is a light body template. The lines of force a-positioned at the heart center reflect the completion of this ascension process. The Template assists humanity to carry increased volumes of light and vibrate at a higher frequency as we evolve into our light body and inner heart. The horizontal line of force, within the Large Diamond crosses & runs through the heart center from front to back and side to side. Within the three dimensional large diamond, the sides, front and back points are all at heart level – crossing and connecting to the Soul Matrix within the heart center, the inner heart. I was shown in a holographic vision that the activation and awareness of the Template of Oneness within our etheric & physical bodies will stimulate the heart center to create concentric circles of light, getting larger and larger until the whole of the torso is an orb of light generating un-conditional love. Circles, within circles – ONENESS. The names of the three overlapping diamonds was sourced from Jennifer Starlight’s book “UNION”. Ask to allow your Ego to come into alignment with your Souls destiny by releasing all aspects of the Ego-Self stopping your progress. Listen to “Amaliah Grace’s Soul Essence Activation” CD and consciously start the process of creating the central cylinder of light within your body, where your Soul Essence will embody itself. When you feel ready or are guided to, meditate upon the Template of Oneness. When ready to receive the template, your guides will ask you to lie down and surrender to the templating process. This process may be shown to you in a vision or through sensations, and will be unique to you. During this process the old template of duality is burned away (be prepared to feel heat as the burning process occurs) and the new Template of Oneness activated and initiated. This process could take up to 1 hour. Take the Soul Essence Integration essence as often as required after this process to assist in the assimilation and balancing of the energy upgrade. Once the Template is fully integrated within your body, you are ready to put the template into action. Breathe into the light at the center of the Soul Matrix within your heart, where the central lines of the greater diamond intersect.